God designed the Church to run on volunteer power. Every member of the congregation is a spiritually gifted individual, after all, called and empowered to do “the work of ministry” (Ephesians 4:12, ESV). And yet, many churches experience a chronic shortage of volunteers. What is the cause of this shortage, and what can pastors and other church leaders do about it? and find the right ministry fit for volunteers. Anderson and Fox were colleagues at Wooddale Church in Eden Prairie, Minnesota—he as pastor, she as director of the Volunteer Development Ministry. In addition to being biblically sound, the advice they offer in this book is undergirded by pastoral experience. 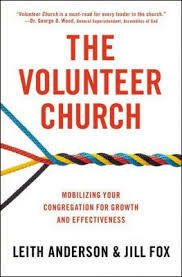 If you are a pastor or church leader looking for help improving your volunteer ministry, this short book is a good place to start. The book’s two appendixes—“Volunteer Development Training” and “Your Plan for Volunteer Development”—are especially helpful. They provide bullet points and discussion questions leaders can use to plan an effective volunteer development program. 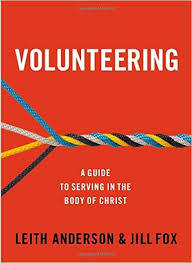 Anderson and Fox’s Volunteering is a companion to The Volunteer Church, written primarily to address the questions volunteers have about signing up for ministry in the local church. Chapter 2, “Finding Your Fit,” is especially useful. It helps potential volunteers assess their spiritual gifts and talents and skills to more closely align who they are with what they do.